Bardsey Tree Services provide hedge removal, hedge maintenance & hedge cutting in Leeds & surrounding areas. From small domestic garden hedges to large commercial hedges including Council contract hedges. If you are a business in the Leeds are and you require a professional, reliable company to maintain and cut your hedges, please give us a call. All work is carried out by safety conscious staff. Operating throughout Leeds. We provide services including hedge planting, cutting and general countryside and woodland management for all domestic and commercial environments. Established hedges require trimming to keep them dense and compact. Formal hedges require more frequent trimming than informal hedges. Bardsey Tree Services offer various hedge cutting and hedge maintenance services. New hedges require formative pruning for their first couple of years after planting. We have specialist hedge trimming machinery and can offer tractor and flail hedge trimming. 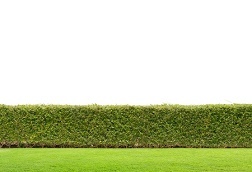 Do you have a hedge that needs removing in Leeds? Bardsey tree services provide a hedge removal service and we have the equipment and expertise to assist in the safe removal of hedges of all types and sizes. 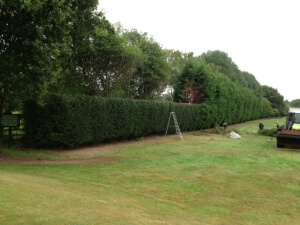 Whether you have a garden hedge to a large conifer or a farm or commercial hedge we can help. Contact us today to find out more. We are able to provide a Tractor Hedge Cutting Service in Leeds, Harrogate, Wetherby, Knaresborough and surrounding areas. If you require this service either as a one off or regularly then please contact us for a free quote. Do you have brown patches in your conifer hedge? Brown patches in conifers can be caused by a number of reasons. Pests or diseases are responsible for some cases, but others may be caused by growing conditions or routine operations such as trimming. Brown patches can appear on any conifers, but most problems occur on Cuprocyparis (Cupressocyparis) leylandii (leyland cypress), Chamaecyparis lawsoniana (lawson cypress) and Thuja plicata (western red cedar). If your suffering from this problem call today on 0113 4182302 or email us to arrange a visit! We take responsibility of wildlife seriously, all care is taken before cutting any hedges to ensure it is safe to do so. It is an offence under Section 1 of the Wildlife and Countryside Act of 1981 to intentionally take, damage or destroy the nest of any wild bird while it is in use or being built. For this reason we always recommend cutting hedges between September and April outside of the usual nesting period for birds. If in doubt give us a call, we offer free advice.